The white laces contrast well against the bright red. Red Converse Chuck Taylors with black & white trim and white Straight Bar Lacing (from Tayler K). A great photo of this lacing method! Black hiking boots with black Hiking / Biking Lacing (from David O). Kevin prefers the loops & ends on the outside. White Adidas sneakers with grey Hiking / Biking Lacing (from Kevin P). Note how this lacing pulls in the corners of the shoes. Blue Pony sneakers with white trim and white Sawtooth Lacing (from Matt P). Lawrence has tucked in the lace ends rather than tying a knot. Yellow sneakers with black trim and black Sawtooth Lacing (from Lawrence V). The result looks almost like military boots. Black sneakers with red & white trim and white Ladder Lacing (from kociaczeqq). Grey Converse low-tops with black & white trim and white Lattice Lacing (from Katie J). This lacing really jazzes up these sneakers. These wide shoes really accentuate the lattice. Grey & white DC shoes with white Lattice Lacing (from Lisa-Marie J). This lacing would really stand out even in the dark. Black Osiris sneakers with white trim and white Lattice Lacing (from Vishal). The lace colors match the shoes perfectly! Blue & white Nike sneakers with blue & white Checkerboard Lacing (from dalyte1). The fat laces really make this lacing. 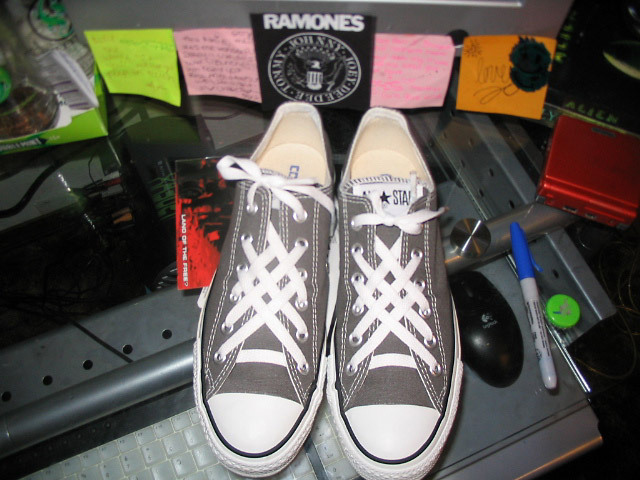 Black Adio shoes with white trim and magenta & black Checkerboard Lacing (from Billy). Varying the length of the vertical runs 'tapers' this checkerboard. Camouflage & tan Nike Dunk SBs with orange trim and brown & white Checkerboard Lacing (from Brian). Nice side-on shot of these sneakers. Blue & white Etnies sneakers with blue & white Checkerboard Lacing (from Lisa Marie J). Melissa laced these shoes for her 9 year old son. Black Adio Bams with cyan trim and cyan & black Checkerboard Lacing (from Melissa W). This lacing ensures that the 'T W O 3' writing remains visible. White Nike XIIs with blue trim and white Hash Lacing (from AirAzn88). This lacing also uses features of Double Helix lacing. Red & yellow Nike SBs with white trim and red & white Double Lacing (from Brian). These thick laces smooth the otherwise sharp zipper design. Brown & pink Nike SBs with white trim and pink Zipper Lacing (from Brian). Very clean look on these Nikes. Grey Nike sneakers with black & white trim and grey Straight Easy Lacing (from Mangolee). These are typical shoes in a trendy Melbourne shoe store. Various shoes with Display Shoe Lacing (from Ian Fieggen). The photo even includes a 'thank you' note! Black boots with white trim and black Loop Back Lacing (from Dj Dani). Even these old boots look great when laced with white 'Bars'. Black boots with white Straight Bar Lacing (from Gregory S). US paratroopers and ceremonial guard units use this lacing. Black Corcoran jump boots with white Ladder Lacing (from Ron B). The 'bars' complement the trademark Adidas stripes. Black Adidas Supermods with white trim and white Straight Bar Lacing (from Chris C). An interesting variation with a knot tied at both the top and bottom. Tan Etnies sneakers with white trim and white Checkerboard Lacing (from Pip & Jordan B). The lacing is the finishing touch on these multi-colored dunks. Brown & cyan Nike Undefeated Dunks with tan & magenta trim and lime green Ladder Lacing (from Grant P). Particularly effective on dress shoes whose sides meet in the middle. Brown dress shoes with brown Roman Lacing (from the Internet). I love it how Brian has used a drum kit as a trendy shoe stand! White DVS shoes with green Lattice Lacing (from Brian W). The stock round white laces were replaced with flat black laces to match the 'Umbro' motif. White Umbro futsal shoes with black trim and black Lattice Lacing (from Jeff T). Another way of wearing shoes with the lace ends hidden. Black Converse low-tops with white trim and white Display Shoe Lacing (from Nicholas S). These bows are sitting crooked, which may be fixed Here. Black PF Flyers sneakers with red & white trim and white Straight Bar Lacing (from Nicholas S). If you have a cool shoe lacing photo to contribute, please e-mail it to Ian. All of the above single-color shoe lacing methods listed in more detail. All of the above bi-color shoe lacing methods listed in more detail. This page last updated: 08-Apr-2019. Copyright © 2005-2019 by Ian W. Fieggen. All rights reserved.